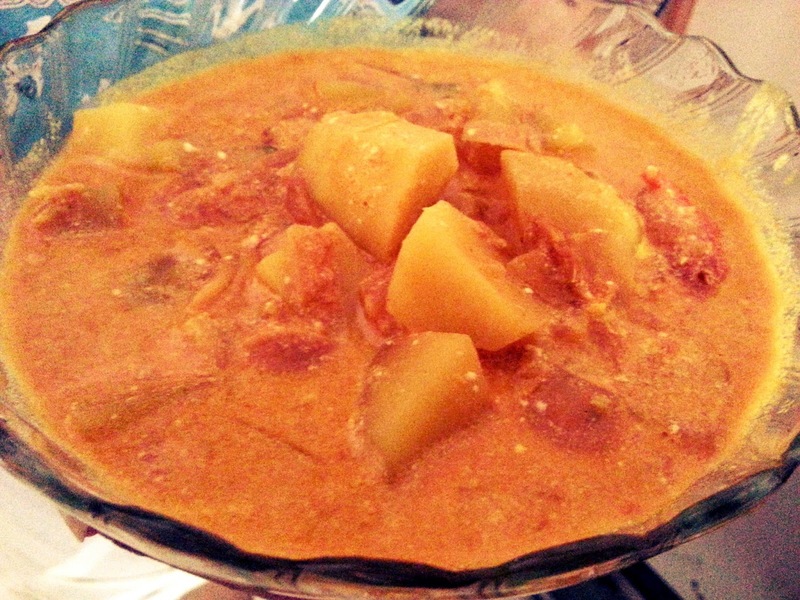 I were a bit reluctant to cook curry with yogurt, afraid it will spoil. However, I took this chance to try to be adventures in meal. Surprisingly, it tasted good. 1. Grind the garlic and ginger to a coarse paste by using a mortar and pestle. 2. Heat the oil in a pan, add the shallots and chilies and cook until fragrant. Add the garlic and ginger paste with the sugar, and stir until the mixture begins to color. 3. Stir in the curry leaves, cinnamon sticks,turmeric,salt, chili powder and garam masala, and toss in the potatoes, making sure they are coated in the spice mixture. 4. Pour in just enough water to cover the potatoes. Bring to the boil, then reduce the heat and simmer until the potatoes are just cooked. 5. Add the tomatoes and heat them through. While hot, fold in the yogurt, then sprinkle with the coriander. Ready to serve.